It's always been just Kate and her mom--and her mother is dying. Her last wish? To move back to her childhood home. So Kate's going to start at a new school with no friends, no other family and the fear her mother won't live past the fall. 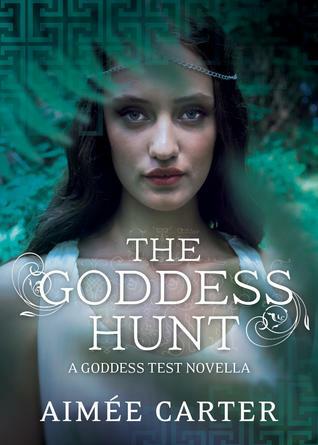 The Goddess Test was my first ever mythology book and I can boldly announce that this genre is officially a favorite of mine! 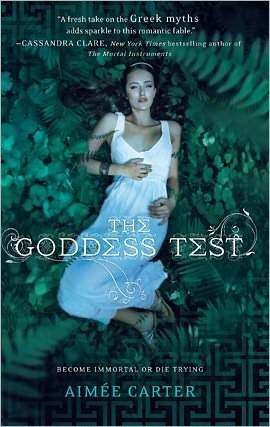 The Goddess Test was such a beautifully written book. The mystery, the secrets, how the greek mythology is infused into the story, it was all such a new and breathtaking experience! Also, the cover is gorgeous! All that green contrasts beautifully with the model's white dress! This book definitely captured my eyes from the first time I saw it. I loved Kate, the protagonist, she was put in weird and odd situations but was always logical and thought through things properly. I really liked how compassionate and caring she was towards her sick mother, who she moved towns for, and also for people she barely knew. After Kate strikes a deal with Henry, the mysterious man she just met, and ends up moving into his mansion, I get a better glimpse of the greek mythology and the stories behind them, which really fascinated me! This book also never failed to amaze me. The romance between Kate and Henry was so unexpected, in the sense of how they got together (I don't want to put any spoilers), and also with all the surprises I kept on getting throughout the book. While I might not know what direction the second book "Goddess Interrupted" will take, all I can say is I can NOT wait to start reading it! I like the mythology genre, as well, and I thought this book was a really fun take on the Persephone myth. Great review! I've been interested in this series from the moment I first heard about it. I'm a huuuge fan of mythology & I'm loving how it's becoming a trend. :) I definitely need to (finally!) start reading these books. Glad to hear you enjoyed this! I can't say it was for me but I think I might still give the second one a try. :) Great review! EEp I love mythology books and i've been meaning to read this one. You should read the Percy Jackson series! book 1-2 are just ok but the rest is really awesome! Great review Juhina I really have to get this one! Awesome review Juhina! I loved it! 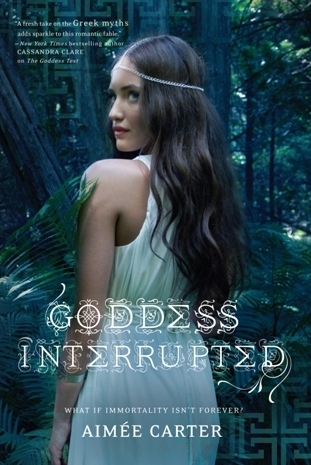 I just finished reading this book and can't wait to read The Goddess Interruption. Loved this book. It makes me want to know more about greek mythology. Absolutely awesome review Juhina! I am a sucker for Greek mythology, wonder why I haven't read this yet even though everyone seems to love it!